The nose has honey, pineapple, elderflower, jasmine and hints of pine furniture. The mouthfeel is thin with no cling. The body has pineapple, honey, banana, monstera and then moves towards oak and with a hint of pepper. The finish has honey, monstera, oak and pepper. Water brings out tight, compact whorling that settles into brief mottling. The nose gains more pine furniture and pineapple, and loses the jasmine and elderflower. 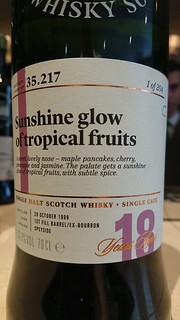 The body gains more pineapple and some coconut, and a lot more oak. The finish gains more oak. A fruity monster with a hint of spice, which I don't think needed much water.